What a save! After unwinding a huge chunk of Wednesday’s record-breaking gain, the bulls pushed back before Thursday’s closing bell rang. The S&P 500 ended the day at 2488.83, up 0.86%, making the discussions of follow through on the reversal effort much more serious. It was an odd reversal of fortune though, in that none of the usual suspects led the charge. 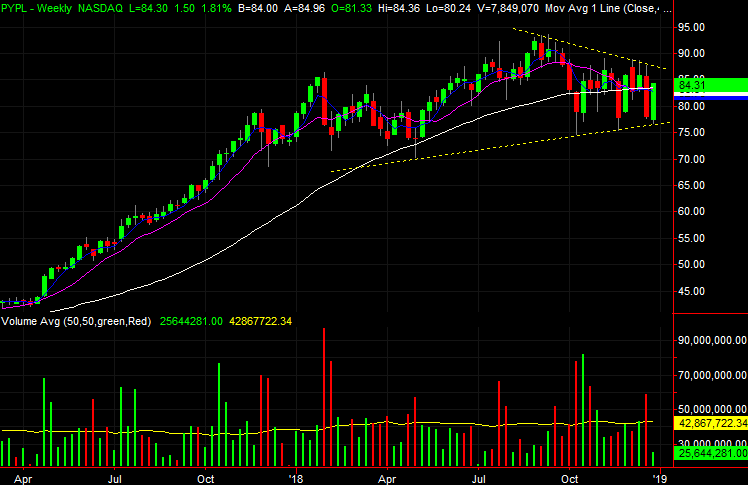 Bank of America (NYSE:BAC) was the most noteworthy winner, up 1.0%, but not on any news. Chesapeake Energy (NYSE:CHK) wasn’t far behind, adding to Wednesday’s gain on the heels of news that it was driving lots of insider buying. Not every name worked its way back into the black though. General Electric (NYSE:GE) fell another 1.6% as profit-takers tore into it — again — after a recent rebound effort. The late-in-the-day recovery really solidifies the bullish argument here, though it’s still prudent to tread lightly. 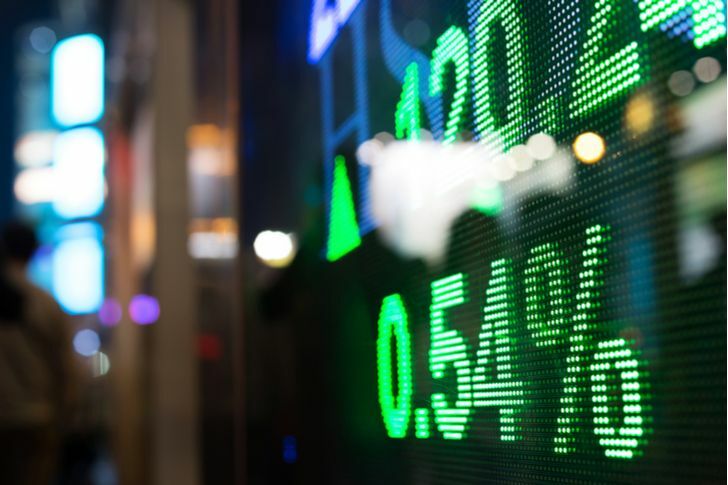 Stocks charts of PayPal (NASDAQ:PYPL), Newmont Mining (NYSE:NEM) and Broadcom (NASDAQ:AVGO) look like the better-founded possibilities as we head into the final trading day of the week. Here’s why. 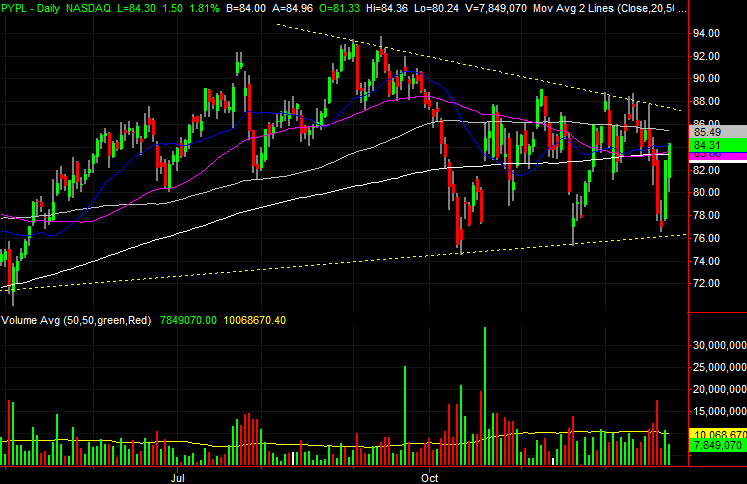 Roughly a month ago we pointed out PYPL stock was trapped in a narrowing trading range. That has not changed. In fact, the boundaries of that narrowing range have been better-defined since our last look. That’s not a bad thing, however. Indeed, we’re much closer to a break outside of that range, and thanks to Wednesday’s and Thursday’s strength, the scales are tipped bullishly again. The shrinking trading range in question is plotted with yellow lines on both stock charts. The lower boundary was confirmed again with Friday’s low. Also on Thursday PYPL stock crossed back above most of its key moving average lines. While the undertow is bullish, what’s missing so far with this rally effort is growing, above-average volume. It has more to do with market sentiment than swelling value of the stock. 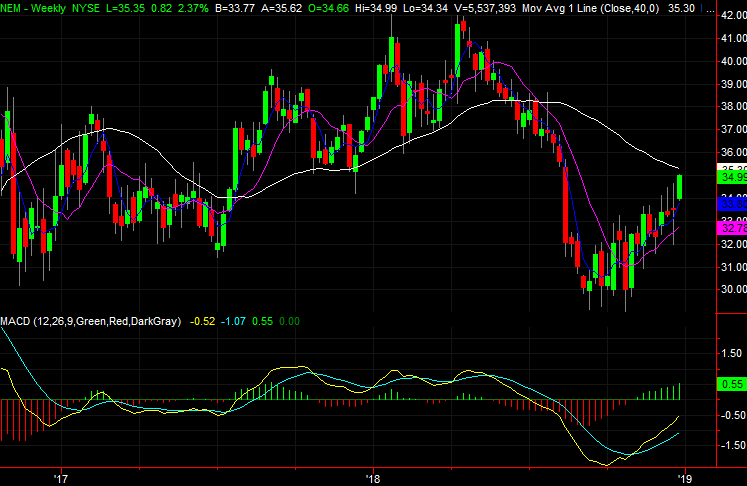 Nevertheless, NEM stock is rallying nicely, pulling out of a steep dive in August that lingered into September. It’s also finding support in all the right places. There’s just one more hurdle to clear … and it won’t be any easy one to hurdle. If it is cleared though, look out above. The make-or-break line in question is the 200-day moving average line, plotted in white. 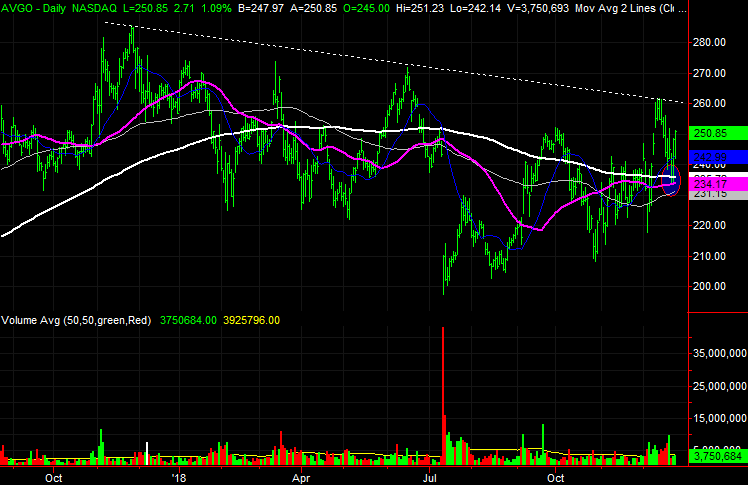 Notice this line was technical support and technical resistance more than a few times earlier this year. In the meantime, the blue 20-day moving average line and the purple 50-day moving average line have acted as a floor, pushing NEM stock to higher highs. Although overbought and perhaps ripe for profit-taking in the very near term, the bigger-picture bullish momentum is well-defined and developed given the weekly chart’s MACD indicator. The past several weeks have been miserable for technology stocks, and by extension, investors. Too many of them have made their way to multi-month lows. AVGO stock, however, has been an exception to that trend. Being an exception alone doesn’t inherently make AVGO stock a buy. But, it sure doesn’t hurt. 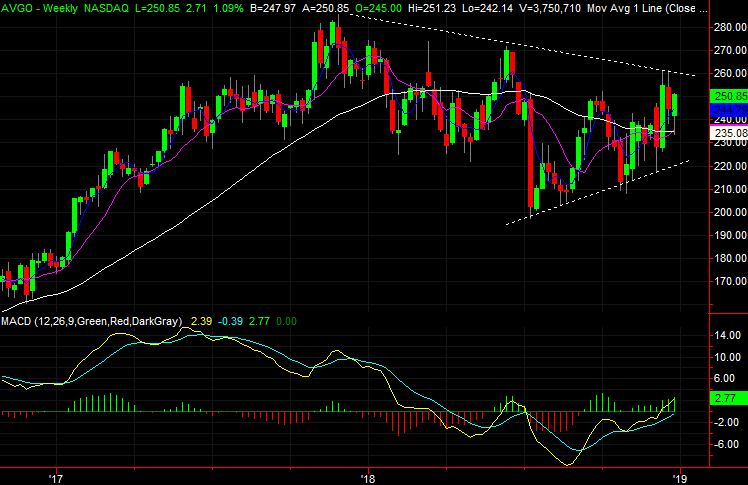 Rounding out the bullish case is what just happened, and what’s about to happen that few other stocks can boast. Credit has to be given for the unusual relative strength seen from Broadcom since late October, when most other stocks were sliding low. 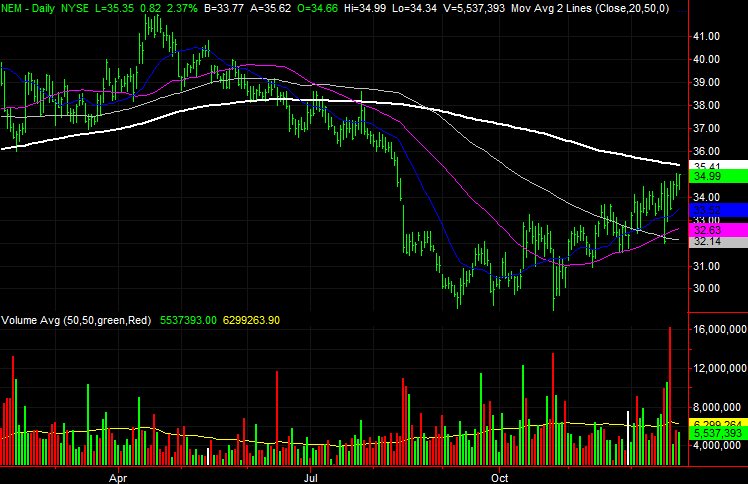 The clincher is how the purple 50-day moving average line served as support earlier this week. Although most stocks have dished out so-called ‘death crosses’ of late, where the 50-day moving averages have crossed below 200-day lines, AVGO is close to forming a golden cross, where the purple 50-day average is about to cross above the white 200-day moving average line. Still serving as an overhang is a technical ceiling that tags all the major highs going back to late last year. That could be tough to clear. Article printed from InvestorPlace Media, https://investorplace.com/2018/12/3-big-stock-charts-for-friday-paypal-newmont-mining-and-broadcom/.